Doomsayers have been spinning the Nintendoom wheel for quite some time; their infectious tone has even managed to make the leap over onto the Microsoft hype train, spreading their hatred of Nintendo toward the black and green brand (and rightfully so). Well, sadly for them (depending on which side of the fence you're standing on), the Xbox One has managed some impressive monthly unit sales in the previous month while the Wii U shows that it's hanging on tight to second place, looking for an opportunity to regain the crown from the console champ. First and foremost, the 3DS is still king. Let's just not even bother discussing it because we know it's true and that's that. The real story is with the Nintendo Wii U. The console's latest Donkey Kong: Tropical Freeze moved 130,000 SKUs in its first month out, according to the NPD Group results, as noted on Nintendo Enthusiast. Nintendo also revealed that Bravely Default, the throwback JRPG for the Nintendo 3DS, fared exceptionally well with a move of 200,000 SKUs in just under three weeks. The news continued to roll out on the road of positivity for the Big 'N', as the company announced that they're looking at an increase of Wii U hardware sales from the same period last year, by more than 25%. Venture Beat estimates that the Wii U moved around 100,000 SKUs for the month of February. That, my friends, is very impressive. Nintendoom wheel? Are you still spinning? I can't tell. This giant monster truck just rolled into the arena called the Big 'N' and it's making a lot of noise and kicking up a lot of dirt with a set of tires called “sales”. This isn't just a truth shared through the positive figures for the Wii U – especially considering that February wasn't a particularly huge month for the little-console-that-could when it came to software. As noted on Joystiq, the Xbox One didn't quite slouch through February like the supposedly morbid, plastic carcass that it seemed like it could have been by now. The console moved an impressive 258,000 SKUs and managed to make more revenue in hardware sales than the PS4, even though Sony's console still moved more stock-keeping units by comparison, approximately 290,000. Total hardware sales came up to $347 million in February when all was said and done, which, according to the NPD Group, is up 42% from the previous year. 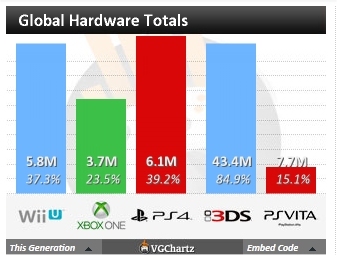 But real money isn't important to gamers... the only thing anyone cares about is where the install base stats sit. That's where the figurative money pot lies. According to VGChartz – and is it me or have they just completely ignored adjusting the Wii U's figures? – the Wii U is still somehow at 5.8 even though they've been at 5.8 since January. Really VGChartz? Really? The Xbox One is now sitting at 3.7 million, which means they're just 200,000 shy of fulfilling Microsoft's previous fiscal shipment of 3.9 million units. The PS4 is now estimated at 6.1 million, which means it's readily leading the eighth generation console wars by a decent margin. May can't get here soon enough. We're counting on you Mario... we're counting on you.